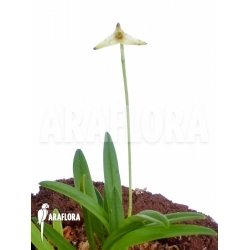 This orchid, the “Tiny Masdevallia”, is a warm to cool growing miniature from South America. It comes from forests at elevations of 200 to 1,500 meters and grows epiphytically or terrestrially. It blooms in the summer and autumn on an inflorescence that is significantly taller than the leaves (see picture). Flowersize is app. 3/8” or 1 cm. This species will make the heart race of any specialist Masdevallia collector.